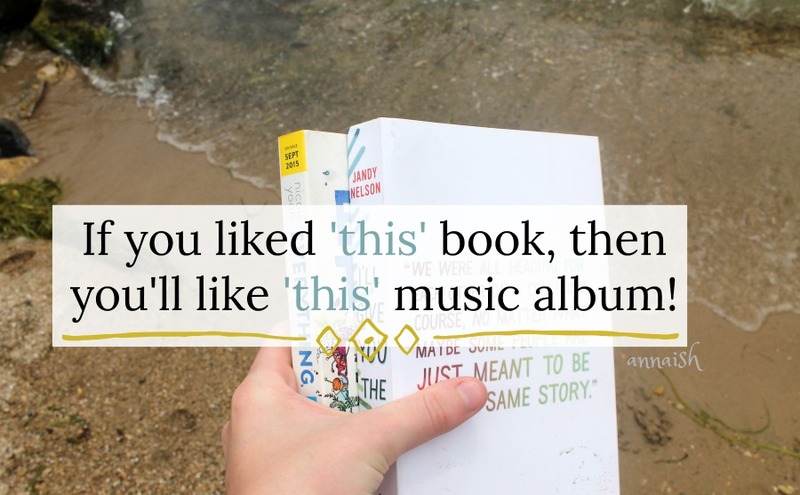 annaish: If you liked 'this' book, then you'll like 'this' music album! I've been quite obsessed with alternative music lately; especially the new stuff. I mean ... I can sing 'Hard Times' (Paramore) by heart now. I have serious talent ya'll. Haha anyway, why don't I recommend some great music albums today?! 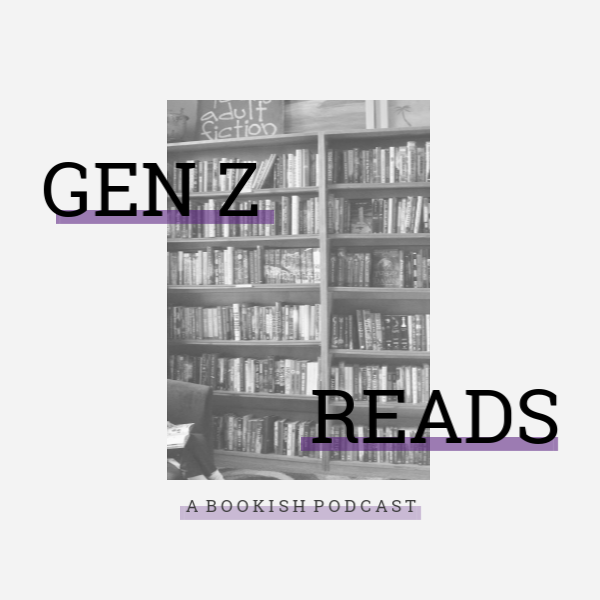 With books recs, of course. :D Enjoy bookaholics! If you liked Queens of Geek by Jen Wilde, then you'll like Sacred Hearts Club by Foster the People! 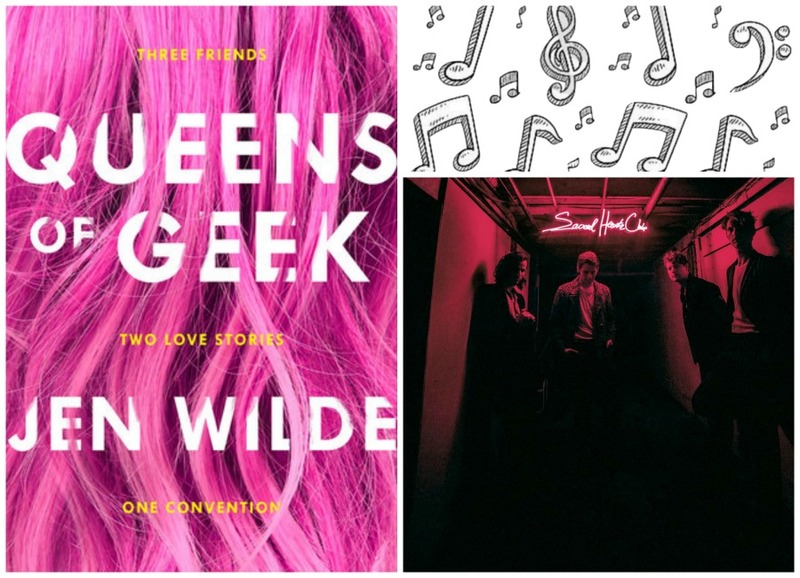 Sacred Hearts Club and smile (a lot) while reading Queens of Geek. If you liked This Savage Song by Victoria Schwab, then you'll like Hopeless Fountain Kingdom by Halsey! I wasn't a fan of Halsey when she dropped her first album (Badlands); I thought it was okay. I only liked a few songs and the dystopian storyline didn't click with me. But, fast forward a year or so, and I'm obsessed with her stuff. I love her voice, messages and her newest album! 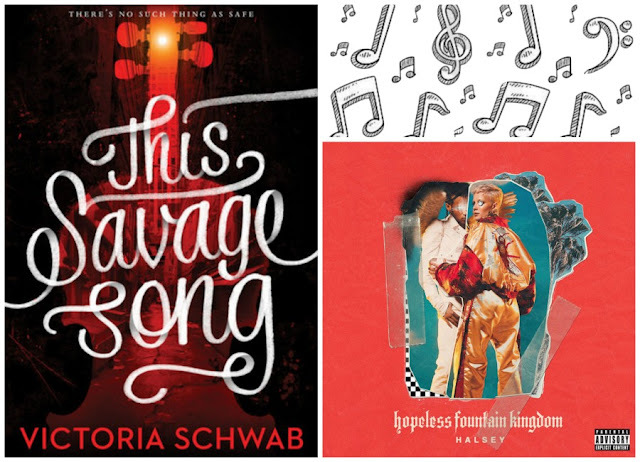 Hopeless Fountain Kingdom follows two forbidden lovers from different fantasy-like households. It's a very tender, enchanting story; and it reminded me of (my fave) This Savage Song. Both are inspired by Romeo & Juliet and they have people divided into clans. The only big difference is TSS has monsters and HFK has angels. How ironic! 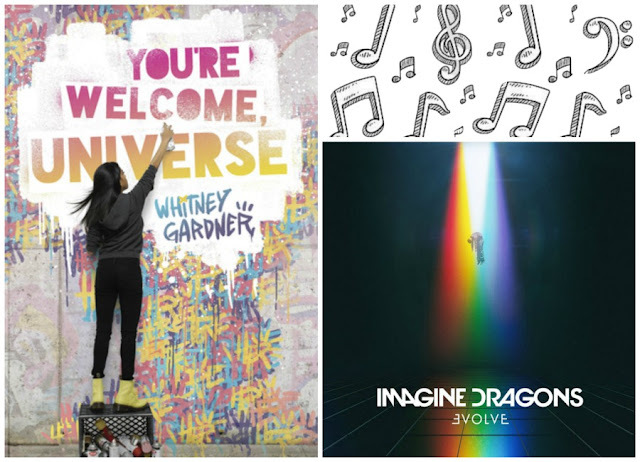 If you liked You're Welcome, Universe by Whitney Gardner, then you'll like Evolve by Imagine Dragons! Imagine Dragons is one of the best alternative bands around today. They have such a unique sound! The band members are so kind and the lyrics can hit you so hard (emotionally). Evolve gives me this energy, like I just wanna do everything; take a walk, clean my room, draw etc etc. It's awesome but Evolve isn't my favorite album. (my fave is still Smoke + Mirrors). And I felt a similar way with You're Welcome, Universe. You're Welcome, Universe started out strong but it closed out weak and cliché. But the book and album still had powerful pros, which makes a great connection! Both have loud, passionate voices, colorful visuals and motivating stories. All-in-all, I liked Evolve and You're Welcome, Universe - they both deserve a listen/read. If you liked Aristotle and Dante Discover the Secrets of the Universe by Benjamin Alire Sáenz, then you'll like Melodrama by Lorde! I LOVE LORDE! The captivating, current story in Pure Heroine blew me away. I love her voice too, that gritty, low voice ahhh it's wonderful. But, her newest album Melodrama, made me feel many things. Some songs had me in tears and some had me dancing. It's so raw and beautiful; I love it. 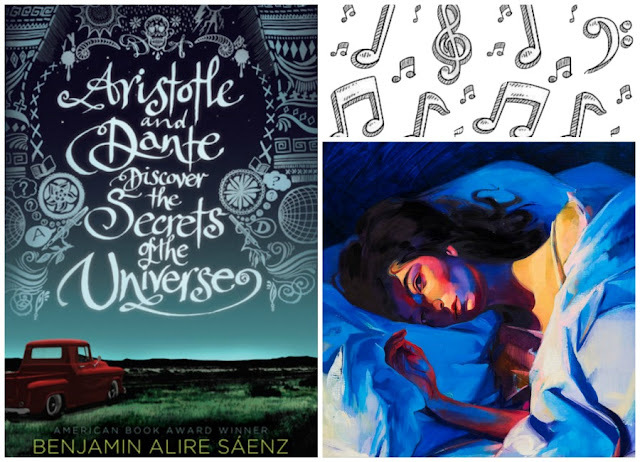 And, while thinking of this post, I knew that Aristotle and Dante Discover the Secrets of the Universe matched Melodrama so well. 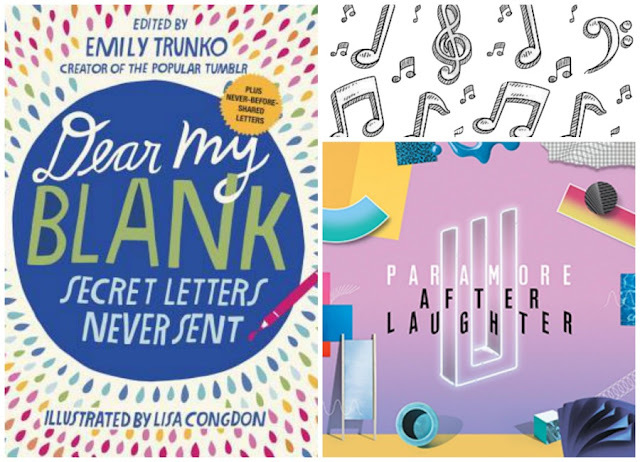 If you liked Dear My Blank (Secrets Letters Never Sent) by Emily Trunko, then you'll like After Laughter by Paramore! Now, I know After Laughter is (still) controversial because it's wayyy different but, my goodness, I think it's amazing. The old Paramore album's are pretty angsty but this new album takes angst to a new level! After Laughter is moody (yes please) but it's also fun! Entertaining! Neon! It also has that 80's vibe. And, at this point, I'm also describing Dear My Blank. Dear My Blank has been sorted into YA but I say it's open for all ages. The book contains secret letters that people haven't sent to family/friends/role models/teachers etc etc. It actually started out as a Tumblr and I must say, I fell in love with this concept. Some letters are straight up sad but others will make you laugh. So is this book moody? Check. Colorful? Check. Entertaining? Check. I think these two work great together. 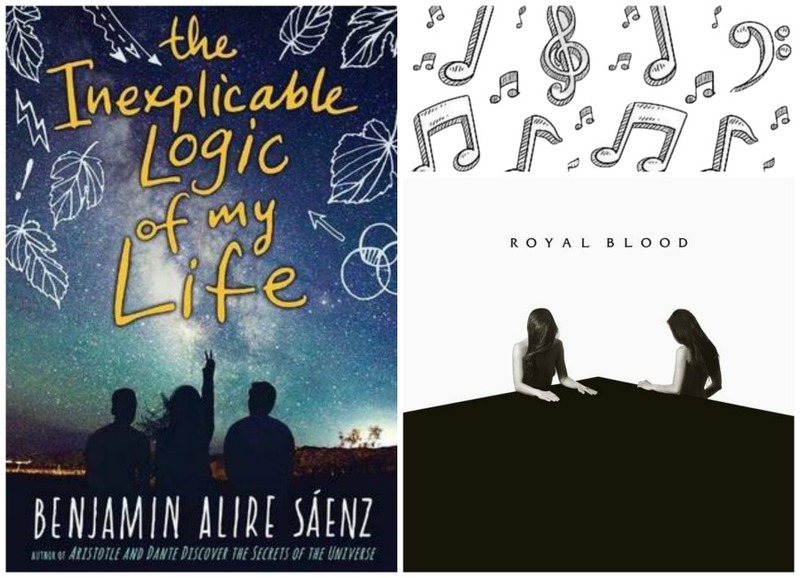 If you liked The Inexplicable Logic of my Life by Benjamin Alire Sáenz, then you'll like How Did We Get So Dark? by Royal Blood! So Royal Blood is a U.K rock band (made up of two guys) and they're so chill, but will definitely rock out. I found them on YouTube because one of their singles blew up on there; I seriously had that track on repeat the whole day. And, me being me, I also stalked them on social media and listened to their albums. How Did We Get So Dark? is their newest album and it's just outstanding. A majority of the album will made you sing/scream the lyrics on the top of your lungs. But how does The Inexplicable Logic of my Life fit with this rock album? Well, they don't connect 100% but there's still something. Like: in the book, there isn't any romantic relationships; same thing for the album. They both also have pretty laid-back storylines and anger (sometimes) flows through the lyrics/words. Overall, I think this is a good pair. 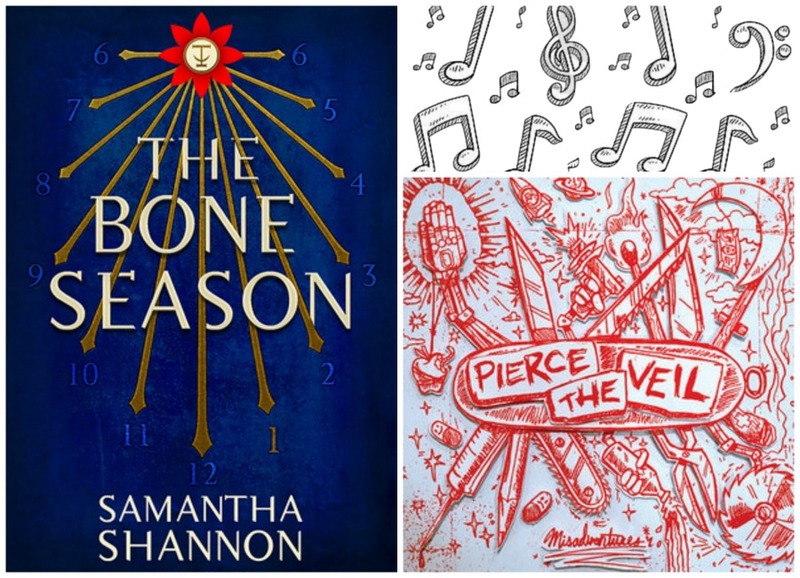 If you liked The Bone Season by Samantha Shannon, then you'll like Misadventures by Pierce the Veil! I love Pierce the Veil ... a lot. Sure, their music is (still considered) emo, angsty etc etc but it's actually really great music?! I also cannot pick a favorite album because they're all sO GOOD. And I might be (a little) obsessed with the lead singer, Vic. Anyway, the point is: the band is great, the music is great and The Bone Season works great with Misadventures. Misadventures follows a modern timeline that covers love, relationships, personal stuggles and the adventures of life. And I think The Bone Season is similar to the album except, it's set in a fantasy world and it's more of a survival timeline. Both covers also match great haha. What a great idea, Anna! I haven't listened to any of the artists you mentioned, but I was just saying to my sister today that I desperately need new music to listen to. So I will definitely check these out! Thank you, Emily. :D Perfect timing haha - enjoy! Ahhh, this is such a cool post!!! Especially since we have pretty similar tastes in music. And I agree, I wasn't originally a big fan of Halsey since I'm not that into pop-ish music, but I slowly fell in love with Badlands and I've been listening to her new album a lot recently. Awesome post, Anna! Thank you so much, Erin! I'm really glad I enjoy her stuff now; I was (a little) disappointed in Badlands. AHHH YES TWENTY ONE PILOTS! GIMME GIMME NOW NOW!